Ayn Rand: with her bug-eyed stare and her extremely sharp shoulder pads, many proclaimed her to be the perfect woman. Ayn Rand (born Alisa Zinov'yevna Rosenbaum, February 2 [O.S. January 20] 1905 - March 6, 1982) was a Russian-born philosopher and individualist, founder of the school of objectivism. Objectivism is a popular political philosophy in the American classical liberal tradition. Ayn Rand herself is a controversial figure, being the only known example in history of someone who was completely self-made. She didn't need anybody at all. Ayn Rand gave birth to herself in Czarian Russia, just to show that she was tough enough. Born at the age of zero, Ayn immediately set about teaching herself Russian-- considered a difficult task at any age. At first, Ayn subsisted on milk stolen from local cattle before moving on to directly killing them. The local farmers referred to her as "el asesino pequeños," the "cattle hacker." Or something. Ayn was known for her ability to make her own clothes from raw materials. At the age of 2, she was able to not only make the blanket she was coddled in, but to coddle herself: the beginning of a destructive life-long habit. 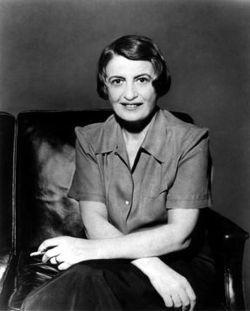 Living far away from civilization, Ayn began her tutelage under Ayn Rand, the Russian-born philosopher and individualist, founder of the school of objectivism. Children: According to reports, Ayn Rand used to be a child at one point. Ayn's solitary life came to an end when she was forced by the new communist government to share her individuality with the state. Ayn did not like this. She did not like this at all. And by "this" I mean sharing. 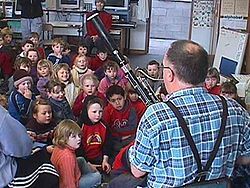 Sharing is something learned by the time a normal child enters kindergarten. Ayn was granted a visa in 1925 to visit her relatives in Chicago and never returned to Russia. The "flying contraption" she created over that weekend out of sticks, held together by borscht, to fly the 10,000+ miles was the prototype used for our stealth bombers today. Rand decided to enter the world of writing in her early 20's without ever having actually talked to a human being. Her early fiction, especially her second novel, "YES," was centered around the ideas of Ayn Rand, but was also semi-autobiographical. Most of her early works used ideas made by herself and shared by no one else. Ayn's early writings made basic assumptions about humanity, such as their weaknesses and their base habits. She only needed to study humans for a month before she began using them in her stories. Her fiction began to take on a life of its own after that point. Rand, who did not believe in democracy, was unwillingly pulled into it. In the 1940s, after allowing a man to marry her, she wrote her first true novel, "the Fountainhead," a story about a guy who kills people living in the houses he himself constructed because the government said they couldn't be as kewl as he wanted them to be. The novel also features clues to the whereabouts of Rand's twelve murder victims. Rand, who still survived off the land and lived in a cave during this time, started the philosophical movement called "objectivism": So called because it is objective and level-headed... not like those OTHER philosophies. Ayn Rand herself thought of objectivism as the responsible son in a family of "total retards. Just... just total retards." Ayn did not like retards. Rand's objectivist utopia, exemplified in her best known novel, Atlas Shrugged, revolves around "John Galt," a middle manager who rose through the ranks at a local television station without any help from anyone, ever, at all. The novel was written before television became irrelevant, and modern objectivists usually replace "television station" with the more contemporary "internet station." Galt and the others at the station are being taxed for creating exceptional programming such as "Child Doctor," "Child in Charge," and many other blockbuster child-themed shows. The dystopian vision of a government which provides a social safety net for the poor is the central contention in the book. John Galt continues his rise through the ranks until he becomes rich... or something... and then he blows up some houses. The book is interspersed with 8-page diatribes, popular with jackasses. Ayn appreciated diatribes and jackasses. Ayn Rand believed people who enjoyed sharing would also enjoy complete slavery. In Atlas Shrugged, the punishment for sharing was instant and complete slavery. According to Rand, because sharing actually lessens the amount of a good available to you, it is bad. Poverty is a punishment from society for being lazy. Rand herself said, "Why are those poor people so lazy? Look at me, I'm rich, white, and I have no mental handicaps, all because of what I've accomplished." When Ayn first came to America, her first sight was of the New York skyline: a testimony to the capitalist spirit of America. At the time of construction, it was possible to send one's children through college by being a construction worker. Thank god THAT'S not true anymore. 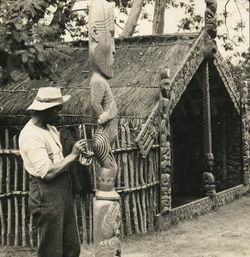 Rand's "family" traditionally worshipped the Peloponnesian god of luaus, Big Papa Ono. Leaving behind the idea of constant flower necklaces and suckling pigs, Rand was an atheist her entire life. "Religion," Rand said, "was dumb. Dumb, dumb, dumb. You're stupid." Every single member of congress who purports to be an objectivist is a Christian. Don't worry about it. Nobody cares. For those without comedic tastes, the self-proclaimed experts at Wikipedia think they have an article about Ayn Rand. Objectivism is a close relative of libertarianism. Libertarianism, however, is less interested in aggressive international politics and atheism. They also want to smoke way more pot. During the first Republican Primary debate in 2011, Ron Paul, a famous libertarian, mentioned "heroin" an astonishing eighty times. He was basically screaming it over and over again at a bunch of old, white people. Ron Paul's son, Rand Paul, changed his first name to Ayn Rand's last name. If he had changed his first name to her middle name, he would be called Ann Paul. Objectivism plans to be around for another forty thousand years before retiring with all the cash in the world to the Cayman Islands.